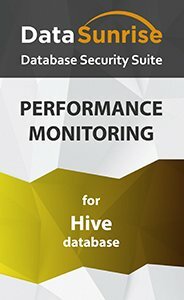 DataSunrise Data and Database Security Suite for Hive is a user-friendly practical solution that along with database security components can be used to monitor Hive operation. Generated information facilitates solving problems occurred during DBMS functioning and identifying vulnerabilities in a timely fashion, as well as serving as an expedient tool for increasing and optimizing efficiency. Analyze the query logs. Unusual and redundunt developer queries can be easily detected. Examine query result log. The handy tool for searching for weak points in application behavior, in case its own logging is not enough for some reason. Inspect execution time of the query and study dynamics of query change in time. Process SQL query types (i.e. SELECT/INSERT/DELETE/UPDATE) and survey their execution frequency. Look at number of rows in UPDATE/SELECT/DELETE/INSERT SQL queries and a diagram demonstrating their change in time. Study the number of operations per second. Get general information on data volume transmitted and received by a database server. Explore other database functioning data. Generally speaking, DataSunrise Database Performance Monitoring ensures clear visibility of Hive operations that makes troubleshooting easier and simplifies identification of vulnerabilities causing DBMS malfunctions.